Cindy Sherman and Barbara Kruger are two seminal feminist figures in art history who fortuitously share the same birthday month of January. To celebrate the occasion, we would like to highlight both women’s significant contribution to the arts through their unique subversive artistic oeuvres. Emerging on the art scene in the late 70s, Cindy Sherman engages in a photographic practice that explores identity, sexuality and femininity. Boldly assuming the roles of both photographer and subject, Sherman transforms herself into a glossary of poses, outfits, and costumes that emulate various female stereotypes and characters. Her authoritative and self-conscious control over her images appropriates the ‘male gaze’ that haunts the canon of art history. Conceptual Art: What is it? 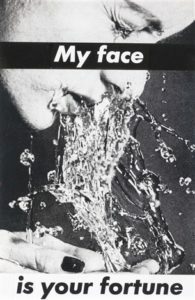 Around the same time, Barbara Kruger developed her signature artistic method of using found images as backdrops against which she inscribes brief, but provocative, statements. Her tongue-in-cheek satirical captions customarily include pronouns that directly confront and involve the viewer with the aim of interrogating contemporary societal norms rooted in patriarchal conventions. She employs capital letters and the colour red to emphasize the boldness and gravity of her words. Both Sherman and Kruger played integral roles in carving out a space for women artists in the mainstream artworld, validating female perspectives in a vastly male-dominated field. They have continued to produce artwork throughout the decades and remain more relevant than ever. Both artists have been the subject of major exhibitions at prestigious galleries and institutions and their work is highly sought after by collectors globally. If you are interested in acquiring artwork by either of these iconic female artists, please contact us.